Joshua says his HFOT home alleviates his current issues and will help with his future plans and endeavors. 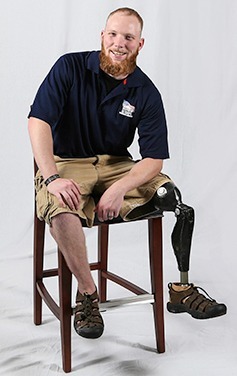 He started a company, Last Leg Tactical, which specializes in equipment for individuals with physical limitations. He is in the process of repurposing the company to work with medics in setting up training events, specifically for dealing with blast-related amputations. He enjoys having enough room in the home and having a peaceful place to relieve stress. Without a mortgage, the worry of providing for his son Liam, is lifted. “It is a tremendous source of pride to own something as significant as a house that allows me to focus on my career and rehabilitation completely,” he says. Originally from Johnson City, Tenn., Joshua chose to remain in the state to be close to family.